The classroom package includes (2) 5-section lockers, (4) 30x60 HPL tables-20"H, (16) 14" hardwood chairs, wall display, dress-up center, stationary iron board with iron, book storage and display with markerboard and set of 4 classic appliances. Classroom package includes a dressing frame rack, tabletop puzzle rack, step-up-n-wash, art center for 2, multi-storage center, hang-up, 30"H double storage unit, (3) open stack lockers 2 units high, (6) 24x48 hardwood tables & 24 bentwood chairs. 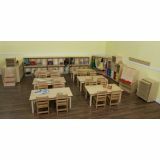 Classroom package includes a dressing frame rack, tabletop puzzle rack, step-up-n-wash, art center, multi-storage center, hang-up, 30"H double storage unit, (3) open stack lockers 2 units high, (6) 24x48 hardwood tables & (24) 12" bentwood chairs. 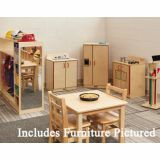 Classroom package includes a dressing frame rack, tabletop puzzle rack, step-up-n-wash, art center, multi-storage center, hang-up, 30"H double storage unit, (3) open stack lockers 2 units high, (6) 24x48 hardwood tables & 24 (12") hardwood chairs. Classroom package includes a dressing frame rack, tabletop puzzle rack, step-up-n-wash, art center, multi-storage center, hang-up, 30"H double storage unit, (3) open stack lockers 2 units high, (6) 24x48 hardwood tables & 24 (14") hardwood chairs. 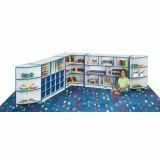 Low Corner Package includes (1) Corner Inside Storage Unit, (2) Rounded Corner Outside Storage Units, (1) 20 Cubbie-Tray Mobile Storage Unit with Clear Trays, and (1) 5-Compartment Mobile Storage Unit. 29.5" High. 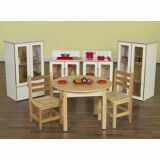 Includes: Natural Pirch Play Kitchen - Fridge, Sink, and Stove; Housekeeping Set and Rack; Square Maple Table with 2 Ladderback chairs, and Large Dress Up Island. Dramatic play classroom package includes My Cottage Set of Appliances in white, 30" round hardwood table (with 20" legs) and (2) 12" hardwood chairs. Dramatic play classroom package includes My Cottage Set of Appliances in white, 30" round hardwood table (with 20" legs) and (2) 14" hardwood chairs. 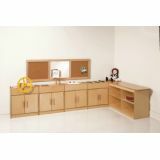 Dramatic Play Package includes Housekeeping Station, 4 Tip-Me-Not Appliances, Dress-Up Center, Doll High Chair, Chair, Sofa, Single Bench, Coffee Table, Doll Bed, Stationary Ironing Board w/ Iron, (2) 12" Chairs, 30" Round Table w/ 20" legs. Set includes 4 Bin-Top Cabinets and one each of the four inserts: Driving Wheel, Sink, Stove, and Checkout Scanner. Also included are one each of the Island Shelves, the Corkboard Mirror, and the Corner Filler.